This classy piece of Eilat stone combined beautifully with sterling silver cufflinks, is what will keep your look alive. It has a graceful dark green stone in the shape of a square surrounded with sterling silver with the design of the Jerusalem wall. Have you ever wanted to look your best? If so this is the way to go. This Israeli jewelry will provide you with the perfection you seek. 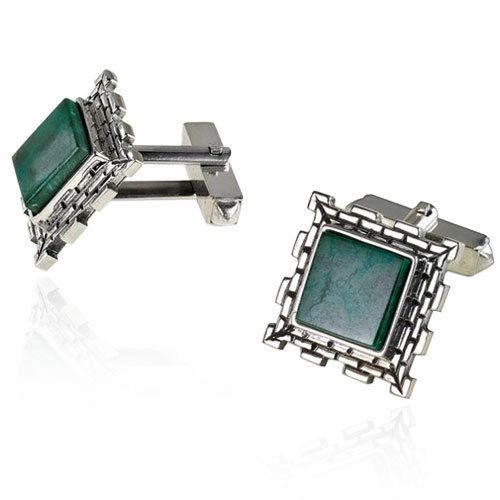 This appealing pair of cufflinks is a mix of a dark green Eilat stone in the shape of a square, surrounded by sterling silver in a delightful design that resembles the Jerusalem walls. These cufflinks will help keep Jerusalem and the Jewish people in your mind and heart wherever you go. Just as the silver design around the stone symbolizes the walls of Jerusalem, the meaning goes even deeper than that, you see because this astonishing Eilat Stone resembles and symbolizes one of the stones that was put on the choshen mishpat, that was worn by the Jewish high priest (Cohen gadol) every day. Wearing these Rafael Jewelry cufflinks is powerful and respectable, their stylish charm adds a sense of fullness to your shirt, there is no way that you can go wrong.